There was some inkling going in that it might be a tough day for the coming 11-time combined champion Williams sisters at Wimbledon. Serena was up against Christina McHale who had taken a set off her in Miami and pushed her to a tiebreak in Rome. And the second round match lived up to the billing. Serena lost a sloppy first set after missing some chances, then found her groove in the second before sinking again going down a quick break in the third. Serena got mad, then turned on the jets to run away with the match 7-7(7), 6-2, 6-4 for her ninth straight win at Wimbledon. “I think it was pretty good, you know, especially in the second set at least,” Serena said. “She played better than I’ve ever seen her play before. She was just hitting line shots from the first point to the last. She closed the match in typical Serena style, smacking three straight aces. “I felt like I was definitely in warrior mode. I was out there playing for my life at that point, trying to play to stay in the tournament. “There were times where I was down and out. I just kept fighting. That’s what I know I can do best. I knew that I could count on that, rely on that. Serena will move on to meet Annika Beck of Germany on Sunday. But the match showed again Serena is vulnerable. The question is, can anyone take advantage? While Serena had her struggles on Center, on Court 1 Venus was in a deep battle with 19-year-old Daria Kasatkina. The young Russian who beat Venus earlier this year in Auckland was once again pushing the 5-time champion around. After splitting the first two sets, Kasatkina led by a break in the third mid way. Venus came back and held a match point in the 15th game before the skies opened up for 1,432,794th time during the match. Upon return, the 36-year-old failed to convert but eventually closed it out for a tough 7-5, 4-6, 10-8 win. Venus, who won singles and doubles yesterday, now gets a well-earned break before playing singles again in the fourth round on Monday against Carla Suarez Navarro. She’s lost to the eventual champion the last two years, and despite her age she’s proven again she’s a tough out. Also getting wins in between the rain drops were Svetlana Kuznetsova, Anastasia Pavlyuchenkova and Barbora Strycova. Three second round matches including 2-time champ Petra Kvitova (down a set) and Sloane Stephens were suspended due to the rain. Tomorrow we’ll see Simona Halep, Agnieszka Radwanska, Angelique Kerber, Madison Keys and Eugenie Bouchard who meets Dominika Cibulkova as the tournament tries to finish the second round and half of the third. 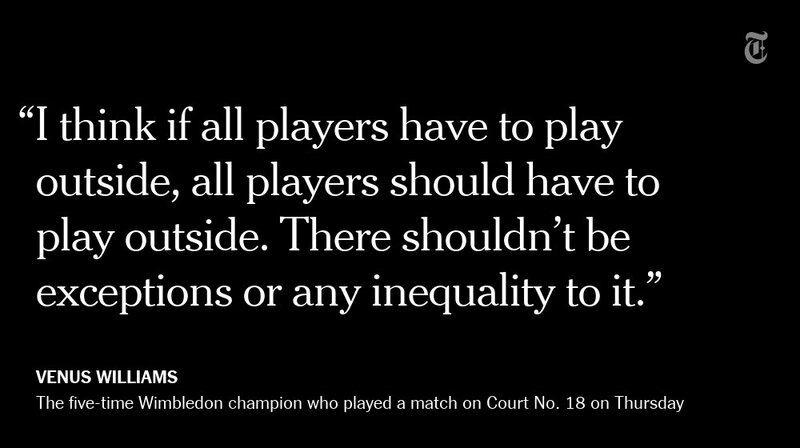 perhaps due to being relegated to court 18? she has a point. having only one covered court will always advantage some and not others. but then the alternative – no roof at all – is not great either. not sure what the solution would be. perhaps there is always some unfairness and that’s it? No unfairness at all. They either play on CC or next best thing is Court 1. It was just unfortunate for joker that he played on Court 1 after having played on CC the match before.